The country of Bangladesh has a spatial project in mind, one that will take their first satellite to be named Bangabandhu-I and take the craft into orbit. An artistic rendition of Bangabandhu-I. To accomplish this deed, the country has signed a 14 billion taka (+/- $180 million) loan agreement with the Hongkong and Shanghai Banking Corporation (HSBC) to finance this effort. Shahjahan Mahmood, chairman of Bangladesh Telecommunication Regulatory Commission (BTRC), and M. Mahbub Ur Rahman, deputy chief of HSBC Bangladesh, signed the agreement on behalf of their respective sides last Friday in the capital of Dhaka. BTRC Chairman Mahmood said the loan, which is to be repaid in 20 installments, has a duration of 12 years with an annual interest rate of 1.51 percent. 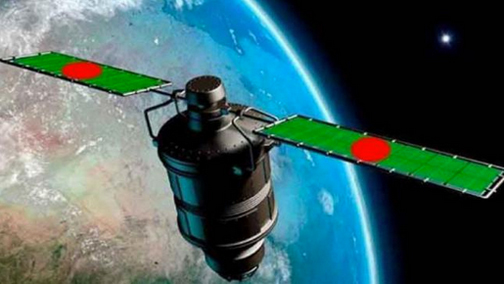 Bangladesh in November last year signed a 19.51 billion taka ($248 million) deal with French firm Thales Alenia Space for the satellite itself. Speaking at the contract signing ceremony, Bangladesh State Minister for Post and Telecommunications, Tarana Halim, said the loan agreement is another step towards fulfillment of the country's dream of launching the first satellite. "With the launch of the satellite we will become the 54th member of the exclusive club of satellite-owning countries on December 17, 201," which is the 45th anniversary of the country's victory in the Liberation War. The Bangladeshi government had previously purchased a 119.1 degrees East orbital slot from Intersputnik for a term of 15 years. The country currently addresses their satellite connectivity requirements by renting bandwidth from satellite operators, which costs almost $14 million a year—the estimate is that this project will reach the break-even status in seven years and allow the regulator to sell excess capacity to other nations. Bangabandhu-1 will be able to provide services to all South Asian countries, as well as others, including Indonesia, the Philippines, Turkmenistan, Kyrgyzstan and Tajikistan, if the frequency is properly coordinated.